Call them car park collisions, bingles, bumps, scratches, scrapes, or dings; most of us have experienced such mishaps in the past, or are sure to find ourselves in such a position at some point in the future. Minor car park damage can all too easily be caused by reversing into other cars hiding in blind spots, misjudging spaces, not seeing bollards, or perhaps you were reversed into by another car? Ouch! 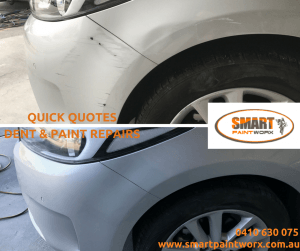 But not for long when SMART Paintworx can have this repaired in a matter of hours. Whether you were at fault or a third party is responsible contact us for a free quote for minor car park collisions, bingles, bumps, scrapes, scratches and scuffs. Whatever you call them, we can provide a quote for the repairs to be done at your home or workplace. With photos of the panels involved, the vehicle details and your contact details we can quote quickly and easily, removing the stress of having to deal with insurance company call centres! We can repair damage caused during slow speed car park collisions to vehicle bumpers, alloy wheels, doors, wheel arches, doors and guards. 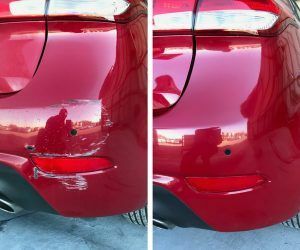 Repairs for slight scrapes and dents caused during car park collisions can usually be repaired at your home or office. If it’s someone else’s vehicle we’ll contact them directly to make any necessary arrangements. Always remember to swap your details with those of the other driver, for all accidents whether they are big or small. 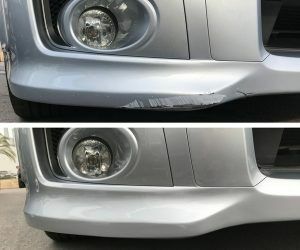 Typical bumper damage caused during minor car park collisions. There’s usually no need to make an insurance claim for minor car park collisions when we can repair the damage for less than your excess. Plus, you can relax in the comfort of your own home, or continue with your work day as normal while our experienced technician repairs your vehicle on-site. If you’ve got access to a private area with access to power, the space for our work van and technician’s tools, then we can bring the workshop to your doorstep! Within a matter of hours you won’t be able to tell that there was ever any damage to speak of and your memories of car park collisions will seem like nothing more than a bad dream. This entry was posted in car park collisions and tagged car park collisions. Bookmark the permalink.